This is an overview of my research interests. See talks and publications for current and upcoming projects. My primary research area is model theory, a subfield of mathematical logic. 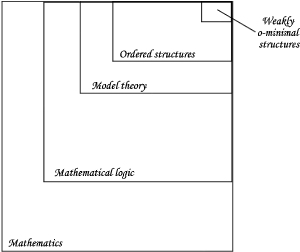 A broad perspective is that model theorists are interested in the underlying structure behind the number systems that mathematicians work with unquestioningly. In particular, the focus is often on definable sets - asking the question, "if I fix a set, a mathematical language (functions, relations, constants), and a set of rules for creating formulas in this language, what sorts of things are definable?" A rough picture of where I fit in. Not to scale. For a better overlay of the world of model theoretic properties, see Gabe Conant's website. Example: In the natural numbers, allowing only multiplication, one can define the primes by a single formula (a formula which states "I am divisible only by myself and the identity, and I am not the identity."). But in the rational numbers, this same formula does not define the primes - in fact because the rationals are a field, every number is divisible by every other number save zero. As such the solution set to this formula over the rationals would be empty. Specifically I am interested in the model theory of ordered structures (the real numbers, say, as opposed to the complex numbers), and even more specifically, my work has mostly been on weakly o-minimal structures. For a more long-form introduction, you can find a general overview of my research (as of 2010) on the web here; also available here as a PDF. My latest slides are up on the talks and papers page. My most recent project has been on strengthening the dividing line between various types of weakly o-minimal structures; a recent paper with Chris Laskowski, "Definable choice for a class of weakly o-minimal theories," has appeared in the Archive for Mathematical Logic. In my work teaching at Columbia College, I have learned to appreciate the importance of a strong focus on pedagogy. Toward the end of improving the classroom experience for my students, and enhancing their depth of understanding of the material, I am working on several projects. I recently presented a lesson module for a Linear Algebra course on using matrix multiplication to create measurements of inter-compatibility. My slides are available here, and a manuscript summarizing this project has been submitted to an educational journal. Recently I have been working on designing problem-types that can be used to motivate the topics in a quantitative literacy class so that students may begin doing mathematics without period of discussion beforehand. My paper, "Quantitative Literacy: Problems that Motivate," appeared last year in the Ohio Journal of School Mathematics; I also presented on these problems at the Joint Mathematics Meetings in 2015. This presentation is available on the talks and papers page. Along with my collaborator, Greggo Johnson, I have developed a simple way to introduce most of the basic definitions required on the first day of a statistics class with a simple survey. We gave a joint presentation on this topic at the 2011 Joint Meetings of the AMS and MAA, which is available on the talks and papers page, and our paper, "Motivating statistics definitions on day one," was published in Mathematics in Michigan, the journal of the Michigan Council of Teachers of Mathematics, in 2013. I am working on a project which uses elementary probability to describe the power of forming alliances in voting situations. The examples come from national and college politics, as well as reality television. I gave a presentation on this topic at the 2013 Joint Meetings Conference, which is available on the talks and papers page. Along with Greggo Johnson and Hunter Johnson, I am working on a research study to measure the relationship, if any, between success in advanced mathematics courses and the extent to which one has an inherently Platonist viewpoint.